Lightning is a fascinating albeit destructive manifestation of nature. Estimates on the average number of persons killed by lightning every year range from 6000 to as many as 24 000 worldwide. Lightning is also the cause of power outages, forest fires and damages to electronics and infrastructure amounting to billions of euros each year, making it a major societal concern. Although lightning protection techniques have seen considerable progress in the past, the best external lightning protection to date is still based on the concept of the lightning rod, invented by Benjamin Franklin almost 300 years ago.l The EIC FET-Open project LLR aims to investigate and develop a new type of lightning protection based on the use of upward lightning discharges initiated through a powerful laser. The laser will stimulate the number of upward lightning flashes, transferring cloud charges to the ground and thus influencing the incidence of downward natural lightning. The use of a laser-based technique to stimulate the number of upward lightning flashes aims at transferring cloud charges to the ground and thus influencing the incidence of downward natural lightning. The laser-based system could be easily deployable for the protection of especially vulnerable installations on a temporary or a permanent basis, like large crowds gathering at events, rockets on their launching pad, storage or transport of hazardous materials from industrial, nuclear, chemical, electrical plants, etc. Left: upward lightning hitting a rocket launch pad. 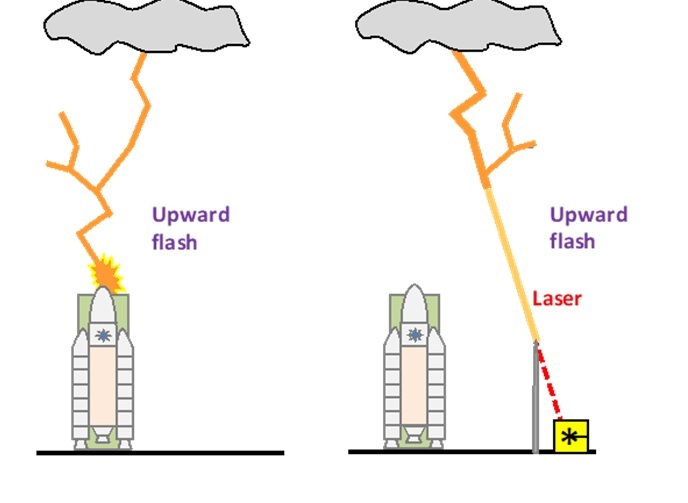 Right: upward lightning facilitated by laser filamentation discharges the cloud and protects the potential victim. To upscale the previous laboratory experiments to real lightning conditions a unique compact laser source with an unprecedented combination of energy and repetition rate will be developed by Trumpf Scientific Lasers. 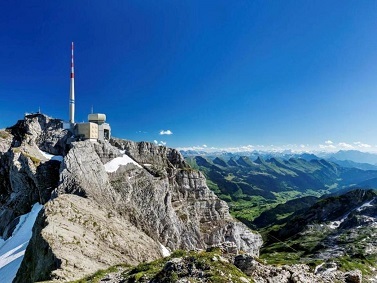 An important measuring system has been set to be able to measure electric field and current of lightning sparks within a distance of 15 km from the meteorological station where the laser will operate. SAENTIS has one of the highest rates of lightning strikes in Europe with altitude 2 500 m, fully instrumented for the detection of lightning. 100 lightning strikes every year; many events of upward lighting leader. A demonstration of laser induced upward lightning will constitute a major breakthrough in lightning research with potentially profound impact on future lightning protection systems. Thanks to the development of such a lightning protection technology, safer air transport is expected, and reduced flight delays due to congested airports during intense thunderstorms activity. Besides important safety issues, controlling lightning strikes on demand will improve also the general understanding of this phenomenon.